How Is Tech Changing Our Interaction With Food? The advent of “The Tech Age” has completely changed the way we operate in the world, on pretty much every level. In fact, you’ll be hard-pressed to find something that hasn’t been altered by the internet, smartphones, machine learning, and all that goes with being the most interconnected generation to have ever lived. Even the most primal act of all – eating – hasn’t escaped the transformative power of modern-day technology. From online supermarkets, on-demand delivery services, and increasingly quick delivery times, to personalised calorie-counting AI technology, fitness trackers, and nutrition plans designed based on your DNA, the way we go about choosing, buying, and consuming food is unrecognisable from what the experience was 60 years ago. Getting food from the farmer’s markets used to be the only way to do so not so long ago. The majority of the food our grandparents would have consumed when they were young was dependent on the accessibility of a centralised farmers’ market. Today, the way we consume food is becoming increasingly decentralised. Apps and services like OLIO, Karma, UberEATS, and AmazonGO are fostering the peer-to-peer, decentralisation culture that has become a paramount in the last decade. But is all this technology actually leading to any benefits? We are now tracking and monitoring our health more than ever, and so perhaps feel more confident in our food choices on the whole, but we don’t seem to be significantly healthier than our grandparents with their farmers’ market hauls and humble hand-made dinners. How do we know for sure that what we’re eating is good for us? Can we leverage tech to create food with artificially high nutrient content? Should we? It is no secret that millennials are the “instant gratification generation”. We have the world quite literally at our fingertips, and our wildest desires at our doorstep within 30min to 2 days, depending on the item. In addition, it is widely known by now that our attention spans are shorter than the notoriously amnesic goldfish. It can’t come as a surprise that food delivery companies are increasingly trying to knock down waiting time. UberEATS famously offered £20 off your next order if your delivery took over 30min to arrive. Millennials are the instant gratification generation, with access to more on-demand services than any other cohort in history. While there is no doubt that big tech companies have played a huge role in improving the convenience and time-efficiency of acquiring fast-moving consumer goods, there is an important trade-off which must be considered. When our grandparents went to the farmers’ market to get their weekly haul, the produce was laid out bare in the stall to be felt, smelled, picked at and picked up by curious consumers. They’d choose their pears, heads of lettuce, carrots, and asparagus, throw the loose veggies in a bag they brought with them, and carry them home to be cooked later on. Sure, we still have supermarkets and farmers’ markets, but the convenience of newer alternative ways of getting food, such as online grocery shopping, take-away delivery services and food-based subscription services, have a serious environmental implication: a massively increased need for food packaging. It is estimated that British supermarket chains create 800,000 tonnes of plastic food packaging waste per year, with some brands doing better than others. Co-op reduced its plastic packaging waste generation by 44% in ten years, from 78,492 tonnes in 2006 to 43,495 tonnes in 2016. By contrast, Aldi’s plastic footprint has almost doubled in 3 years, from 37,261 tonnes in 2013 to 64,000 tonnes in 2016. What’s more, only 5% of the packaging they generate is recycled. If those figures weren’t bad enough, consider the added packaging needed to store and transport foods by delivery when an online grocery shopping transaction is completed. And while individualised food delivery companies like HelloFresh and Gousto are making an effort to create recyclable boxes, the fate of the material still very much relies on the end-user taking the time to recycle the material, something which the UK doesn’t do nearly as well as their European peers. The UK lags behind their European cousins when it comes to recycling rates. While policies that encourage recycling such as the new plastic bottle and can deposit return scheme are most certainly a step in the right direction, we have a long way to go to mitigate the environmental effects of increased reliance on packaging that has arisen from this individualist, decentralised dogma. It is interesting to note that sustainable best practice is considered to be preventing waste wherever possible, as outlined in the waste hierarchy proposed by the EU Waste Policy and Challenges for Regional and Local Authorities report. Preventing waste cuts down on the emissions needed to process the recyclables, which can be quite high in some cases! That being said, it is certainly not the case that it is impossible to live sustainably in the modern tech age. There are some fantastic tech-based services which have nailed the marriage of on-demand/convenient and environmentally sound practices to create outstanding business models. Such an example in the food world is Farmdrop. Farmdrop delivery fresh, local and organic produce to your door, just as you would expect from a regular online supermarket experience, except they do so with zero packaging. Instead, they use big crates to carry food into your home, empty your goods onto your counter for you, and leave with their crates. It is a simple thing, but surprisingly hard to find replicated in the food delivery space. Hats off, guys! AI and Deep Learning – The Quantified Self Making us Healthier? Another major way tech is influencing the way we interact with food is by providing us with the ability to track details around several aspects of our well-being. This idea has come to be known as the quantified self, or “personal informatics”. The aim of quantified self is to gain insights about one’s behaviours and habits, with the aim of adopting a healthier life through continued monitoring and improvements. We see it with fitness trackers, step counters, and calorie and nutrition counters like myfitnesspal, but it is a concept that has yet to be fully taken in to its full potential. We are now tracking more health and wellness metrics than ever. But is it making us healthier as a populations? One such unusual and interesting example is Yelp. The recommendation platform is putting its own spin on the intersection of AI and the food experience, developing a software that uses AI to recommend restaurants to users based on their seemingly-endless database of photos. The software relies on a form of machine learning that involves training neural networks to solve problems using large sets of data. Specifically, it is utilising image analysis techniques to identify colour, texture, and shape, meaning it can recognise the presence of say, burritos, or whether a restaurant has outdoor seating. The tech can then synthesise this information and spit out auto-generated tags for the restaurants based on the photos associated with that eatery with 83% accuracy. Yelp plans to use this technology to improve search recommendations, among other functions. Another example is the integration of AI with our everyday devices to monitor metrics of well-being. For instance, Samsung recently announced the integration of calorie-counting API CalorieMama with its personal assistant AI Bixby. 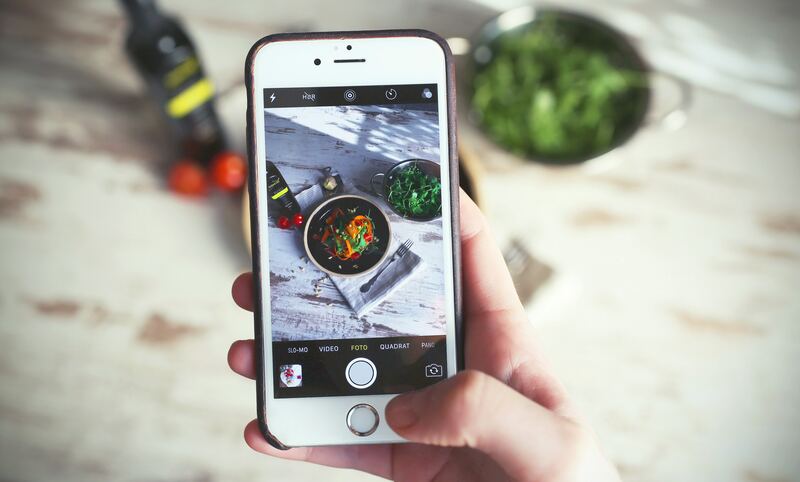 CalorieMama works using image recognition software to discern the constituents of your meal from a photo you take of it just before you tuck in. This means that users will be able to track their macros and nutrients by just taking a snap of their meal (which 69% of millennials do anyway). Of course, tech giant Google is developing its own version of the same concept, called Im2calories, which uses deep learning to help keep track of calories in a meal. When two players as significant as Samsung and Google are racing to create the same concept, you know it is likely to have a strong future. Whether these developments in technology which enable us to track metrics like sugar consumed and calories burned are actually leading to any public health benefit is a as yet unclear. We certainly aren’t a substantially healthier generation than previous ones as you might expect with technology like this at our disposal. The life expectancy in the USA actually decreased for the first time ever recently as the result of non-communicable, lifestyle-related diseases like coronary heart disease and cancer. Perhaps if we were to segment society according to who indulges in tracking their personal informatics, we would see stratification along those lines which suggest a positive correlation. However, that data remains unavailable and so the real impact on health of measuring how many steps you took yesterday or whether you ate too many carbs on the weekend has is yet to be determined. In any case, there is no doubt that technology has and is fundamentally changing the way we interact with the most basic of human needs – the way we think about, produce, supply, and consume food. In an age where we have access to more information than ever, we just need to be mindful of the responsibility that comes with that power, and utilise it in a way that will best benefit our personal, societal, and environmental health, and make our grandparents proud.